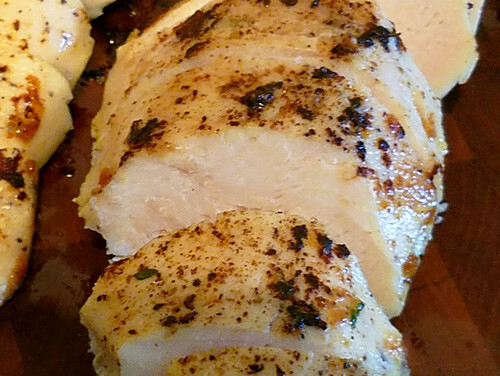 Sous Vide Cont’d: A Newbie’s Experiences; Please share Tips & Recipes! Plllog started a thread about sous vide “Don't like sous vide?” which interested me as I’d been looking at sous vide cooking for over a couple years but hadn’t taken the plunge. I hope others are interested as well. Please read through it if you’re new to sous vide as there is quite a bit of helpful information and discussion! Long story short, I decided to give it a go, along with a food saver for using with the sous vide. I’m including my initial ‘newbie’ experiences, thoughts, methods (temperatures and times), results, recipes, and cost (because it’s better than restaurant fare, and far cheaper). I sous vide 6 days in a row, the day after I received my sous vide. Brutal honesty here, folks, including my successes and failures! I hope those of you familiar with sous vide will chime in, correct me where I’m wrong, add your time and temperature experiences, and sous vide recipes! I’ll add each of my attempts one at a time in separate posts (this might take a while, I’m helping DH pull electrical wire today). My initial plan was to start with tougher cuts, but those took too long to thaw, sooo…. Preface: 5% of you might not know I do not have a kitchen due to remodeling. My temporary kitchen is in it’s 3rd location now. Poor lighting, folding tables, storage bins, utility sink only. 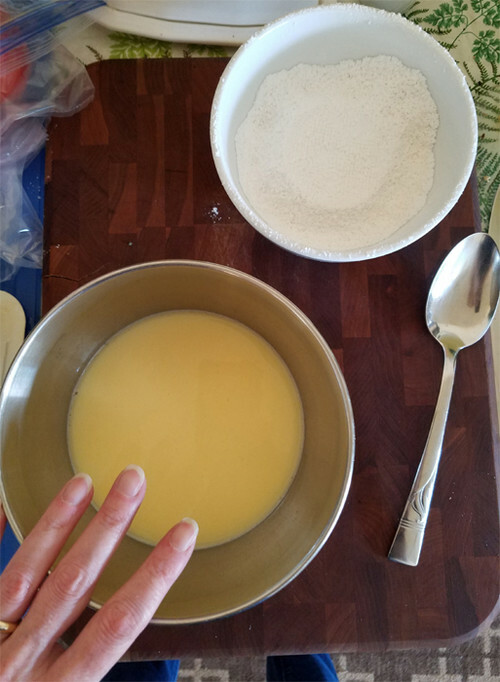 Prep area is limited to 12” x 15” which hangs over a folding table – this is it below (included fingers for scale; the bowl is small). I do have an equal size space next to that to hold measuring cups, ingredients, etc. I have a single electric skillet to sear, it reaches 400 F max. No sauce pans, no cooktop/range. Other than that, a gas grill, Instant Pot, microwave oven, and ancient toaster oven. I am limited but not in heart! Prep: I rubbed the raw fillets with a bit of sea salt, topped them with fresh dill, lemon zest, and crushed garlic. Placed a couple pats of unsalted butter on each and sealed. Salmon will have albumen build-up (the white stuff), but I think that goes away with searing and I’ve read brining also helps – I did neither. I was in a rush and did not sear ours, but served it straight out of the packet, dribbling the melted butter over it. I removed the crushed garlic. Results: Lukewarm at best, I should have seared it. However, I’d eat it that way again… and again. 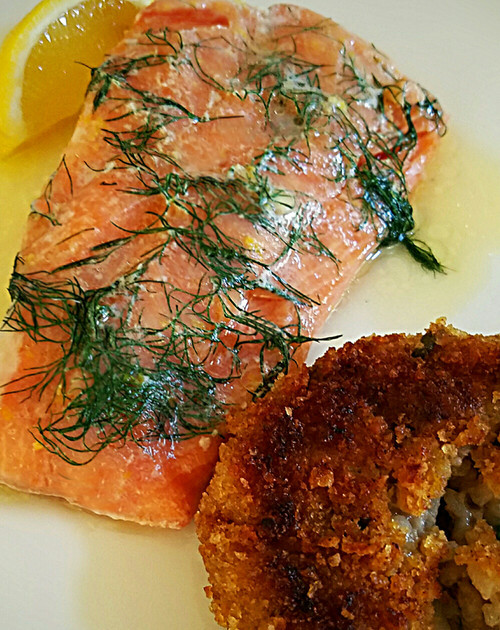 Perfect texture/doneness from thick to thin, incredible flavor – the dill, the mild garlic, and the salmon flavor were the best I’ve ever tasted. I tend to marinate salmon for about 2 hours and have never gotten this depth of flavors. I can pan cook salmon, grill it, and bake it… Maybe twice in all my years I’ve gotten salmon to that perfect doneness throughout. Twice. This was incredible. Also, I left the skin on during sous vide (I hate trying to remove it while raw). It easily peeled off, keeping the salmon intact for serving. Had I a fryer, I could have fried the skin. Or left it on and pan seared it to a crisp on high heat. And I can’t wait to try cold salmon salads! I might not wish to grill salmon after sous vide for the simple reason that it was so delicate. But I’ll try searing in a pan. Any one sous vide frozen salmon fillets? Time added and temp? Anyone grill salmon after sous vide? Did it hold up or fall through the grates? Time/Temp: 140 F for 45 minutes. Prep: I snipped the top of the shell, gently removed the meat (mangling it because I’ve not touched lobster in a long time) and placed it back inside. I’ve since read you can par-boil lobster ever-so briefly to prevent that mangling. Keeping it in the shell, I used kitchen shears to remove the sharp tips along either under-side of the shell as well as the ‘pointy things’ in the middle of the underside so they wouldn’t poke holes in the vacuum seal. Also clipped off the legs. I placed salted butter inside the tail with the meat and sealed. Placed in an ice bath for 45 minutes, removed the meat, then placed in the fridge until I was ready to make lobster rolls. Results: My most recent lobster tails have been overdone, dry. No amount of clarified butter could resolve. I just stopped ordering lobster. 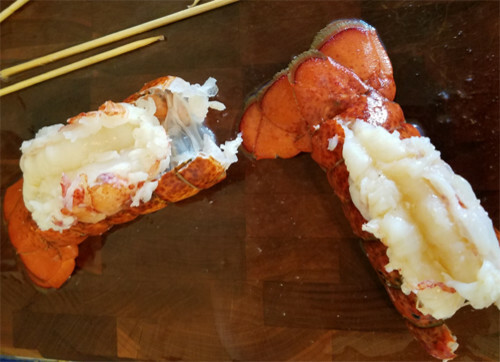 To continue: I couldn’t resist, I had to eat some of my sous vide lobster straight out of the shell and pulled off a piece at the end of the tail – no butter, just lobster meat. This was sweet, juicy, lobster-y in flavor, tender but not too, and utterly divine. I left my body for a moment and just floated in lobster goodness nirvana. I ate 2 more tiny bites and made myself stop. Though the Lobster Rolls were amazing, next time I will not adulterate that sweet succulent lobster with anything but a little clarified butter! Anyone ever sous vide a frozen lobster tail? Time and temps? 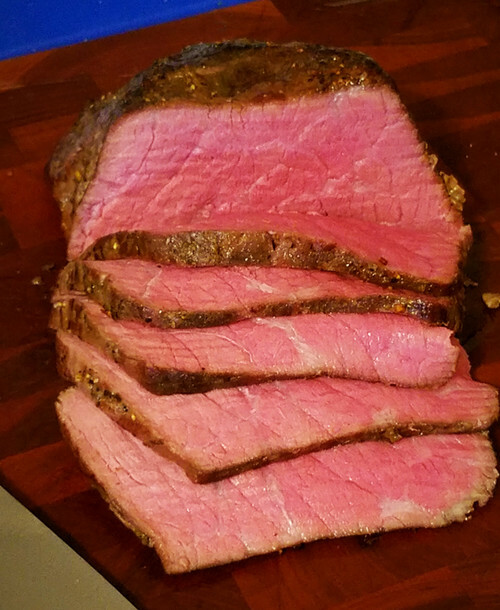 Next up was a tough cut of red meat: Round Sirloin Tip Roast, around 2+” thickness ($3.98 lb, purchased 2 lbs). Made mistakes here, but that’s what this is about. Prep: Cut mine in half, sliced off the fat, seasoned with garlic powder, sea salt, paprika, and a wee bit of homemade Lawry’s seasoned salt – all seasonings lightly applied. Added 2 sprigs each of rosemary and thyme. Vacuum sealed. Mistake number 2 was making a paste of roasted garlic, prepared horseradish, chopped rosemary and thyme for finishing off in the oven (a sous vide Serious Eats recipe). Prep Cont’d: Applied the paste too thickly and put in 450 F oven – paste never crusted, after 8 minutes I removed and was left with medium doneness. Results: Paste was too strong and hideous looking. Meat sliced beautifully. Lovely flavor – almost like a prime rib, not juicy as I hoped, and then I got to my second slice… was that…? Yes, The Mush. Not extreme, but it was there. Now I know. Still had to use a regular table knife to cut, but the mush texture was just too… mushy. DH loved the tenderness. Ha! Removed the paste from the remainder, sliced and used it for sandwiches – wonderful! I did not hate this, but I want to find that perfect texture w/juiciness, and the good sear : ). Add’l Notes: I dislike our deli roast beef. No matter what I buy it just has an off flavor to me and it’s too chewy. This was not. Far better flavor. For $4 we each had 5 slices meat with our meal (we’re big eaters! ), plus enough left over for 3 full sized lunch sandwiches. That’s .80 cents per serving. And it was the smaller piece. Next time I will try 14 hours (anyone care to comment?) and perhaps add roasted garlic and horseradish with seasoning in the vacuum seal, sous vide, and pan sear or grill sear on high heat quickly (avocado oil). Would still serve the juice at 1 minute heated and seasoned, or put in a pan with wine, garlic, and shallots, reduce, finish with a bit of butter, and serve over the meat. There are other things to do with the juice like make a gravy… others will add comment on that with recipes I hope! I couldn’t find a thicker cut – no flank steak either, this was maybe ¾” at thickest to ¼” at thinnest, no lie. No way was I going to get this seared and keep it mid-rare. Oh well. Removed uber-thin skirt steak from marinade that morning, dried off, added a bit of kosher salt, folded the steak over, and vacuum sealed. Prep cont'd: Just a smidgen of avocado oil on high heat, seared for 15 seconds only! Results: What?! Med-rare at the thickest (3/4”) part??!! Incredible beefy flavor, very tender but still the perfect chew. Said a while back I was sick of Mexican food (DH’s favorite) but we’re having this again next week! And the next week! So easy to put it all together too! DH raved! Had guacamole, Mexican Crema only as toppings. Made a good-sized meal for the 2 of us, plus huge cold fajitas for lunch the next day ($3 per meal for the meat only). Mix all of the above and add to sous vide bag, reserving 1/3 for later. Heat skillet to med-high, add glaze, sauteed apples and onions (onions translucent, apples tender but with bite). Remove, crank up heat, add 1-1 1/2 tbs butter to whatever glaze remains, sear chops on all sides quickly. Place hash on plate, place sliced chops on hash. I had a bit of glaze left as I made extra, so added to the skillet after the hash was done and reduced, then drizzled over all. To season, fresh grated pepper and a hint of salt. If I’d cut the entire pork loin into chops (I saved over half for Canadian Bacon) it’d been $1.81 per chop. Prep: Vacuum sealed 2 breasts, S & P only. 1+ cup shiitake mushrooms, sautéed. Added ¾ cup heavy cream, 1 tsp. paprika, stirring until thickened. Removed. Added chicken breasts to hot skillet with some of the sauce bits left, seared quickly on each side. Sliced, served mushroom shallot thyme sauce on top. Results: Sliced beautifully. 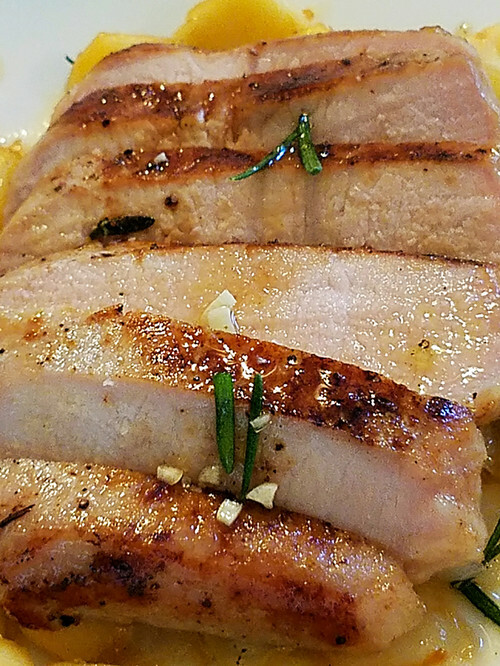 I ate a bite of chicken breast before saucing – moist, tender, perfect. This would make fantastic chicken for salads, sandwiches, everything really. The only time I prepare boneless, skinless chicken breasts is to poach for salads. Otherwise it’s too dry and chewy. Not this. Only thing I’d change is cutting the breasts in half. They were too big and we couldn’t finish ours! Another keeper recipe. Another sous vide success! To summarize: Sous vide is not cheating, it’s another cooking technique – an amazing one! It won’t take the place of grilling, or other types of cooking, but I am so thankful to everyone who contributed to plllog’s thread and encouraged me to go ahead ‘pre-kitchen’. 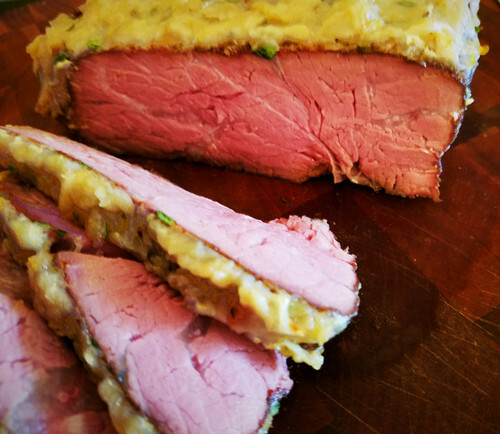 I am beyond impressed and I will use sous vide regularly – it definitely helps cut cooking time (yes, I said that), and finding the correct time and temp will result in excellent outcomes. I expected great results – and I was impressed. I was exhausted most nights, and every meal was easy for me in my temporary kitchen – that’s saying something. We would not have had so many great meals, so many diverse meals otherwise. In a real kitchen, sous vide will be a valuable tool. Like risotto in an instant pot, sous vide requires no babysitting, allowing time to do other things. If not using right away and not freezing, put in an ice bath after sous vide – 45 minutes. Then refrigerate. Garlic in sous vide will have raw garlic flavor, so roast and add if you want cooked garlic flavor. How long to add to time when sous vide from frozen. 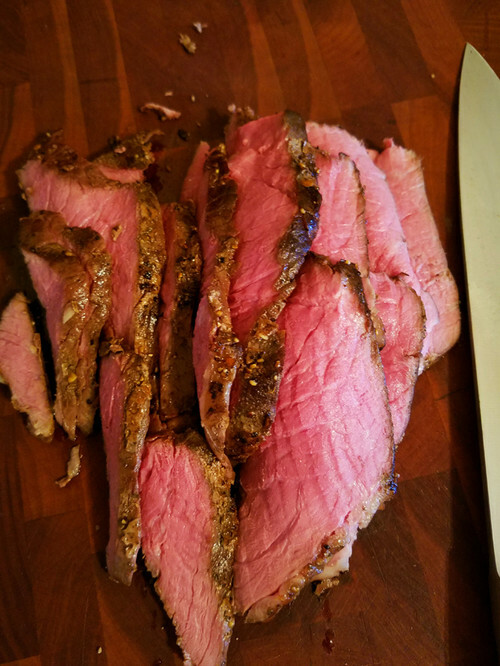 Question: What are your sous vide cooking time and temps for a top round roast? Ok, please post your experiences, recipes, and tips/times for your sous vides! And questions too! Okay 2Many, I confess. We also had mush..... er I mean 27 hour sirloin tip. It's a good thing that it's a cheap cut, because although it's sitting in the fridge (we had it last night) I'm not sure if I'll attempt to find a way to make it edible..... I kinda doubt that's possible, or if I just cut my loss and toss! Now I'm going to go back and read the rest of your posts! Sherri, I used the rest of mine in sandwiches - you don't notice the mush so much! Added horsey sauce, lettuce, red onions to the sandwich. I have the other half of mine still in the freezer, and will attempt it again not nearly as long a sous vide time! 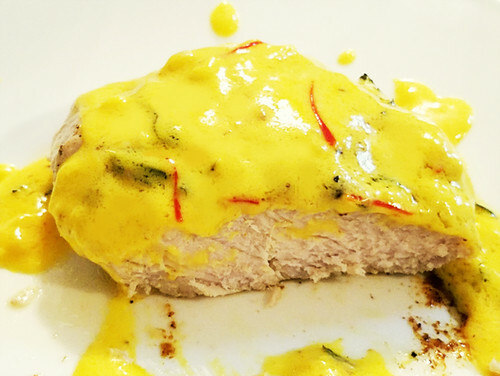 Here is my link to my chicken breast recipe. I'd post but every time I try to copy/paste details here, the edit says I have too many characters (by a ton) to post. 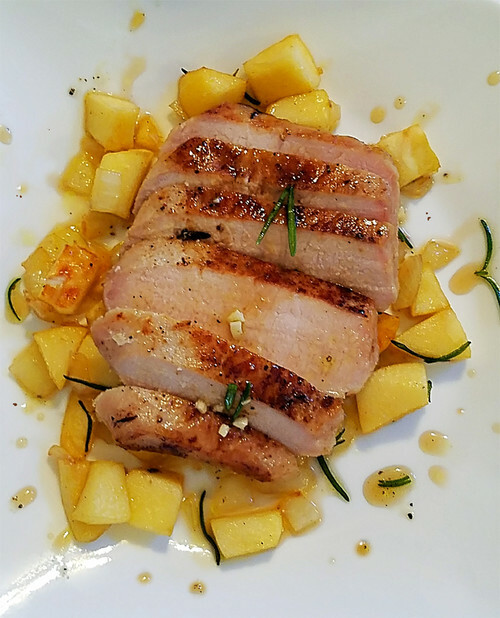 Thank you for sharing artemis_ma - I like the bacon wrapped breast idea for the sous vide! I did use your suggested temp for my chicken breast - loved it : ) I'm excited to try this recipe. 2Many, I was up way too early to really read your posts, but I'll definitely come back to them when I'm fully awake. The sum I got from skimming and reading your last post is that you've been having a ball, and really getting good benefit from your new toys. Congratulations! I think, also, because of the relative convenience of sous vide in inconvenient circumstances, you're benefiting greatly from the tossed-in-at-the-deep-endedness of it all. :) You have the great opportunity of thinking, "What interesting thing can I make, given I can sous vide?). Since I got mine long after I had an exquisitely functional and superbly equipped new kitchen, I generally have an easier path of least resistance. :) I'm particularly intrigued by the lobster. That never occurred to me since I don't generally cook lobster. I might attempt it given the precision of the circulator, which could make up for lack of experience, for an upcoming birthday dinner. Thanks for the idea! I have so much more fun with the zen of veg and sides and sauces, it is nice to let the proteins just sit in the bath and be perfect when I need them. Not really that tricky to do two or three different at the same time. Especially the one-two hour, then adjust the temp. Then freeze or have something ready in the fridge for tomorrow. More a winter thing being a grill/smoker these days. How about shrimp. Can you get good wild caught frozen. Excellent treated just like lobster. Chopped and made into a salad on a roll. We call it 'Shrimp-on-a-squishy'. Made famous by a sandwich shop out on LongIsland. Buttered toasted light brioche with a shrimp salad. I did pick up this weeks sales. I'll Vide the top round tomorrow and might just freeze since I have ribs for the weekend. Or give one top round some cross hatches and miso glaze, then under the broiler top side only to sear/crisp, ... for sandwiches. Freezer is stuffed right now....cooking more than consuming in this heat. Last 'London broil/top round' we cut 2 in half. DH remembers 10 hours, two we iced for the freezer, and one we seared in cast iron, and the other we took to the farm to grill. The one we had that night we left in for 12-14. I failed at writing that down. Ah, yes, congrats on the lobster. I have two sealed tender cooked packets for more rolls soon. It freezes beautifully. I prefer the very lightly 'dressed' NewEngland style over the Connecticut all butter. We just butter and toast the rolls. you clearly have not been helping hubby enough: you have great looking nails, and fingers that could play a harp. Now, translating that to a non-kitchen should be a snap, with SV. I did not go the food saver route ... yet, just freezer strength zip bags ... and I use a foam cooler as my water reservoir ... frees up space and a pot. Tougher cuts, like round steak, are great in a 24-hour SV cook. Throw some carrots in a separate bag with some lemon pepper and orange peel, you've got a meal, and maybe some planned overs (leftovers) for later (or a 2 am snack to go with the grilled pineapple). SV also makes great burgers in about an hour. I'm glad you're enjoying it. I have found that the only way to go is start a spreadsheet with all your findings so you can modify your recipes as you go along. For me, the one place I go to first is chefsteps.com. they are wonderful - but I'm sure you've already found them. I wonder if time of year makes a difference to some meat. For example, I usually do a leg of lamb at 55C for 24 hours and its perfect but in the spring, when the lambs were very young, it was mushy. Something to consider. 2Many, your pork looks wonderful! Actually, all your meals look great. I'm thinking I want to come and live with you. :) What did you use for time and temp? 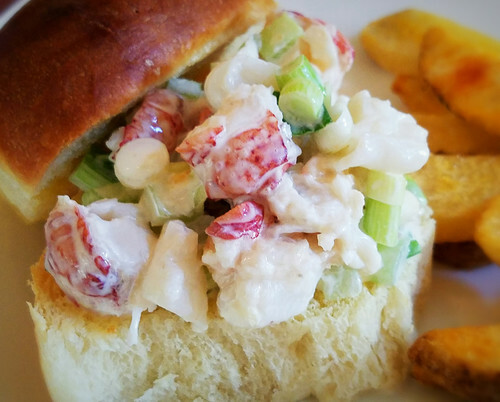 I've never been a lobster fan, but I do have some shrimp that I'll try for shrimp salad rolls later this week. DH is taking the next few days off work so that means I need to think about lunches other than the piece of last night's protein that is typically my lunch. Plllog, my goodness yes, I’m having a blast! And equally important, I’m learning how valuable a tool sous vide is! The preciseness of the cook is amazing (except the one mistake I made in an overly long time with the mushy sirloin roast). I think you should definitely give the lobster a go! I couldn’t believe how easy it was, how amazing, and most importantly, how perfect it came out – no concern to overcook. I’m very picky about lobster too, given the expense. Oh, and Bragu mentioned the Screaming Of The Lobsters (Sorry, Hannibal Lecter reference there!). 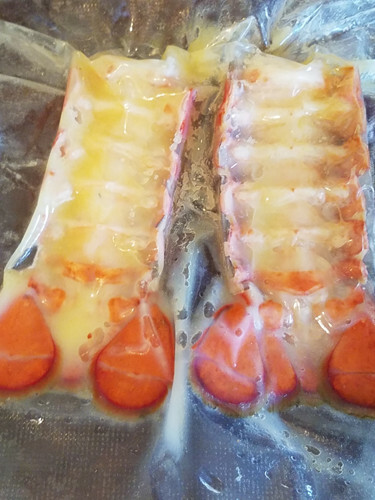 I’ve read to par boil whole lobster after twisting the head off… prior to sous vide : ) I’m excited to hear sous vide lobster can be frozen from sleevendog also, for the next time I find it on sale (which wasn’t this time!). All things considered, DH and I have had more than our share of fast food of late, and the lobster meal was far less expensive then a couple fast food burgers and fries. Sleevendog, don’t you dare say no need for a kitchen – ha! Exactly! Enjoyment of veg prep, sides, and sauces while the protein sous vides to perfection! Making a note: Top round from 10-14 hours – thank you! Uh, so, you live in shopper’s heaven?! Those prices! I may have to move next door! Gruyere buy one get one? Lucky to find cheap cheddar for smoking as BYGO – mostly it’s the processed slices. I’ve got 2 other grocery stores I’ll hike to to find Top Round – I’d love to give that a go. Multi-cooking… will need to attempt that next – sure want to try carrots, and artichokes! Envy your cold smoker! We are running out of smoked cheeses and far too hot here. BTW, did you enjoy the smoked top round Sunday night??? I remember you smoked it at 180-200 F for an hour after sous vide..
Gonna look for round steak too, thanks for the mention and time! 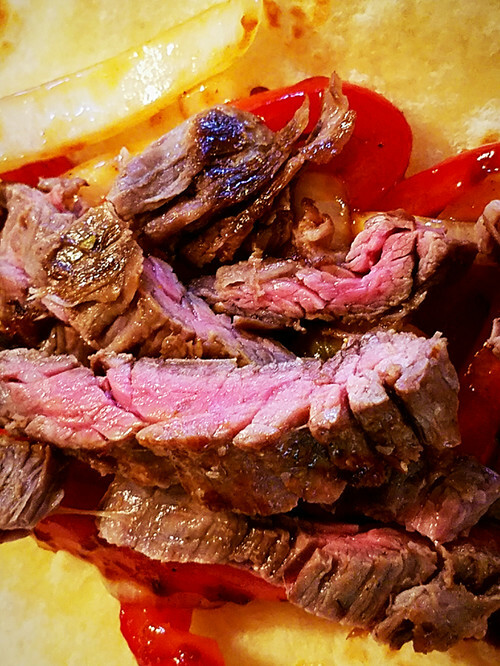 Aw, you had to mention the grilled pineapple didn't ya – sous vide then grilled steak, carrots, and dessert – sounds good to me! Islay, I’ve a confession… I downloaded your Excel spreadsheet you posted in part a while back, printed it. I’ve started my own… see, I pay attention! Thank you for the chefsteps mention. Sleeve had mentioned Serious Eats, and I’d been using both to look for time/temps, recipes – good to get your endorsement/approval because one never knows! I will pay attention to my Excel sheet and note the times of years too… very excellent point. It's a possibility. Oh, so much I want to cook, so little time! 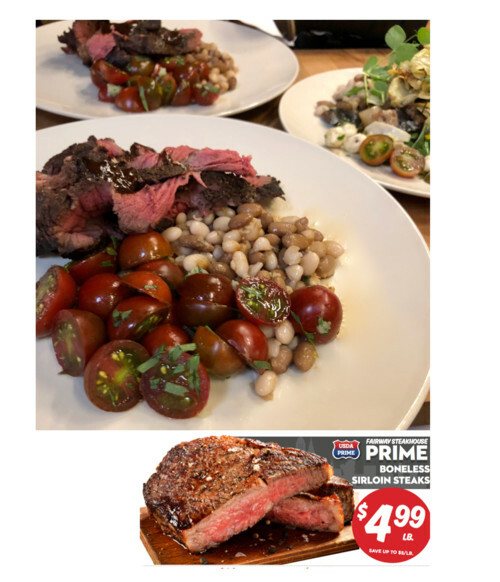 Electricity is off/on all week, and the grill will be moved to a very difficult spot tomorrow, so good thing we overloaded on some great sous vide enabled meals this past week! Wonderful post! Really enjoy reading it because ( I belief) I was the very first here to experiment food prepared using SV. At that time a SV cooker was about $2,000. I had to make my own. "Question: What are your sous vide cooking time and temps for a top round roast?" I have done it about 48 hours at 131F. The good thing about not using vacuum sealed bag; you can always cut a small piece to taste test. Dcarch, you make the most awesome gizmos! Dcarch, high praise coming from you as I know you sous vide quite a lot! Thank you : ) Oh, I remember the $2,000 days! I wanted one then and thought to perhaps use a PID controller (no circulation) added to a fryer, but decided against that. Bided my time! Clearly you were far more adventurous! Found some New York Stips on sale, but they were Select (which I would never attempt any other method) and went for 132 F (too high, will go 130 F for mid-rare next time) and only 4 hours – didn’t have anymore time that day. I’d try 8 next time for such a cheap cut as Select. Zero marbling on the two I sous vide – but still tender enough to enjoy. I left off all seasonings, reading that salt could make meat dry (??). I did notice they were juicy. Grilled to finish with seasonings. I bought several, so I will also add seasonings minus salt next time. Thank you for the sous vide time and temps on top round. Now I’m very confused! 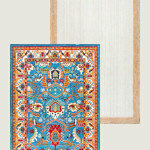 You do yours at 48 hours, Sleeve at around 10 – I get that we all like different textures! 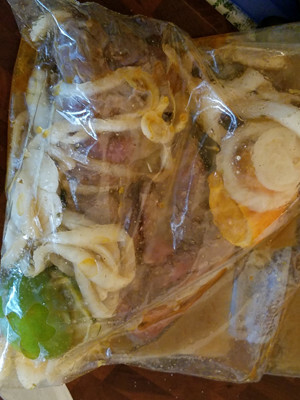 I’ll just use the ziplock and experiment when I have the sous vide available for enough time, and test over time. I did find a top round roast which I cut in half for 2 ‘experiments’. It’s a bit cheaper than buying that processed lunchmeat for our lunches (and far better!) – but I also want to make an entrée out of it too. It was $4.99 a pound not on sale. Plllog, isn’t that the truth? Dcarch told me how to keep slugs out of the herbs/garden, we’ve seen his cold smoker – as well as Sleevendog’s, his clever temporary winter greenhouse, and on and on. I admire that type of ingenuity and initiative. Finding out I didn’t have to have a compost pile was yet another thing dcarch and Annie shared with me (that was a surprise and relief!). I love making things myself, but have never to the extent of dcarch! The good thing about not using vacuum sealed bag; you can always cut a small piece to taste test. I can't believe I haven't read that before. Thanks darch! It's tips like that which I'm sure will make a lot of difference (and save a lot of dinners) in my house. Sherri, there's also the combo approach. 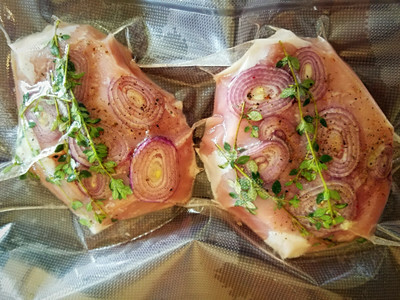 If you want to vacuum seal in order to prep ahead, or use the vacuum to speed the marinade, you can cook as normal until you want to sample it, cut a small hole near the top in your vacuum bag so you don't lose the juices, and test the food, then, if it needs more time, put the whole thing in the zipper bag and use the water displacement to push out the air. At that point of the cook, you only need enough air out for the heat distribution. You can transfer to the zip bag only, or reseal the vacuum bag if you've left enough margin, but it should work without the fuss and bother and waste. Thanks plllog! I used to have a vacuum sealer but it was one of those things that I never used, and hence never made it back to the new kitchen, so I am using the water displacement method. I just don't know why it never occurred to me to open the bag part way through a cook! You do need to think of food safety if you decide to do a little quick taste. For instance, if I taste a small piece of beef SV at 129F, I always have the small piece of beef get a quick burn over the stove to sanitize the surfaces. "Finding out I didn’t have to have a compost pile was yet another thing dcarch and Annie shared with me (that was a surprise and relief!)." What's all this? I missed that, please direct me to more info. Was going to post Serious Eats lobster directions, but it appears you are aware. All your efforts look great! Wow, just WOW! When you make a decision, 2MD, you jump in with both feet and arms! You astound me with all of your experimenting during a kitchen reno! And further renos when the kitchen is done, I'll bet. Your meals are incredible, I wouldn't even know where to start. I too enjoyed reading the sous-vide thread from earlier. I learned a lot as well. Everything you made looks incredible, but the steak fajitas, that's the one that truly jumped out and if it could, onto my plate. I also noticed your long fingers and nails. Perfect for piano playing. Last nights sirloin. 130º for 3 hours, then iced, then onto a hot wood fired grill. About 2 1/4 pounds cut in half. We only ate a 1/3rd of it. The rest for an easy salad tonight, sandwiches (garlic/horseradish cream), and fajitas or tacos tomorrow. I started a SousVide photo file where I keep time and temps. 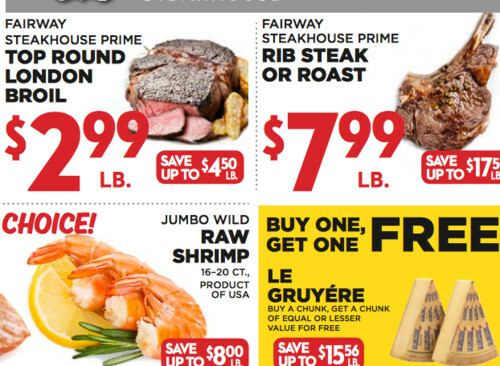 The grocery adds are not a brag...I just like to have it with my file pics. It does help with time/temp to know the cut and thickness and quality. I tried the beer bait (just attracted more slugs!). When we redo our veggie garden I’ll do this, and also for the herb garden redo. I have a terrible time with slugs eating my seedlings. Thank you for explaining the reasoning behind long sous vide times – I knew it broke up connective tissue. “The Serious Eats, Kenji, I'm pretty sure, chuck recipe is for three days. :) And oh, so good!” – thank you! I’ve never tried bison but had venison some time ago – it had gone bad, then was cooked (restaurant). The smell wafting to my nose was enough to put me off forever. Still, I’d give it a go if I had some : ) And I’d not thought of vacuum seal, then taste test, then re-bag with a ziplock! Duh! Mercurygirl, re: the no composting… rather than repeat and get it wrong, here’s the convo on the Punxsutawney Phil thread dcarch started. The comments are further down quite a bit : ) Amazing what one learns here! Jasdip, oh yes, we are planning to do the rest of the house later (minimal in most areas, but the bathrooms concern me as I’m out of my element there!). I just want to get through this phase… whew! The steak fajitas were amazing if I say so myself! (and I still can’t believe how thin that skirt steak was) LOL! I just cut my nails 2 days ago… They were hideously long, not a chip, and once again I had caulk, more bondo, primer, and spent one day just scrubbing and sanding! They are already growing again :( But yes, I do love my long fingers now… I can reach all kinds of things, ha ha! The carrots were something else. Even DH couldn’t stop talking about them (the meat and potatoes man!). Tender firm is how I’d describe them.. or 'just perfect’. I put them in the skillet with the butter contents, added mint, and in no time, perfect minted carrots (yes, I add my mint while cooking for the flavor). Usually I add too much water and get soggy carrots… not this time. 183 F for 1 hour. Oh, and I did sear the salmon this time! Sunday morning I tossed half a London broil top round (yeah, found one!) in the sous vide, and 10 hours later pulled it out (couldn’t wait, it was getting late for us!). Seared uber-fast in the electric skillet and it was fantastic! Thicker slices for dinner, thinner for our lunches. I honestly think it could have gone another 3 hours safely. Texture and doneness were great! 131 F, 10 hours. I didn't salt the meat before sous vide (don't know if that makes a difference), but seasoned it well before searing, added some sous vide juice back to our dinner but didn't need to, it was juicy anyway. No mush! So, does anyone notice any difference between salt and sous vide vs. no salt and sous vide as regards moistness? All of this Sous Vide talk lately has me interested in trying one now... it might actually get my wife interested in cooking. Hey, we an all dream can't we? Any who, you might check out this video, and actually their whole channel if you haven't already. They have a lot of good info and do some useful tests to help you achieve better results cooking with SV. Now, if I ever find Prime sirloin at sleeve's cost (I won't, our Select is right at that cost) I'd buy the store out! I'm right there with you on most of this. I see the major benefit of SV (for me), is that it can be cooking while I'm at work and be done when or shortly after I get home for me to sear. I don't have a problem grilling and cooking to perfection, but my normal process of reverse sear means a steak can take over an hour to cook plus the 45 minutes to get the egg to temp. We regularly don't eat during the week until 8-9pm and I've spent most of that time I'm home in the kitchen. If she does nothing more than drop the steaks into the water when she gets home, that saves us (by that I mean me) a ton of time. For those that have one, can you set it to turn on at a specific time? Say i takes 1-2 hours to heat up your water, can you program it to turn on 1-2 hours before you get home so the water is up to temp when you walk in the door? I know some you can log into remotely from your phone, but if I forget to do it, that screws things up. Steve, to my knowledge there are no sous vide's that have a delayed start. I suppose if you felt adventurous, you could put it on a timer... but it doesn't take that long to come up to temp if using hot tap water. Most proteins don't require the higher temps that say, some veg's and potatoes do. I think the Joule heats up water faster but am not sure. Heating times are dependent on the amount of water you use, the outside air, the container (insulated or not) and other factors. I know if I go from room temp to temp it takes a while. Hot tap temp to med-rare temp takes very little time. I did get the 900 watt Anova. If you use a stockpot, you can place that on your stove to heat the water further, but I personally would not, and if one did, I'd recommend testing the water temperature independently before putting the Anova in. BTW, that app... never stayed connected, so I never used it. If I left the room it'd disconnect. I dislike phone apps anyway. You can pre-cook on the weekend or late at night on long cooks and turn off in AM, ice bath then freeze or fridge, then when ready set the temp to just a tad under original sous vide temp, re-heat from thawed or frozen which takes a bit longer, and sear : ) Setting the temp to just under keeps your food from overcooking. Steve, I'm sure that there must be a circulator that has the kind of function you want, but if there isn't, you could just set it before you go. For that, you'd want a good lid, and enough water that you don't have to worry about evaporation. If you can walk away from it with your 36 hr. chuck going, surely you can do so with it empty. I don't imagine it uses a ton of electricity. 2Many, thanks for the info, also the link to the no compost thread. Makes me laugh a little. My garden is too small to till. :) In more citified realms, we put our compostables in with garden waste for the city to pick up, and when you want compost, you just ask for it (free). :) No fuss, no bother, though we do pay for it with our garbage collection fees. @pillog, unfortunately, I'm not sure any do. The ones I looked at haven't offered this feature to protect themselves from idiots that would put raw chicken in room temp water when they leave for work and then it sits there for several hours before it starts up. I do see the Anova does have a feature called ice bath that would allow you to put ice water in your vessel, and the unit will monitor its temps, and when the water gets above the safe temp (like 40 or something), it turns on the heater/circulator to jet outta the danger zone. I see some that modify coolers for their cookers, and this would probably work very well for those. Of the machines I've seen so far, I'd really like to try the Anova, but it now requires you to have a facebook account, and log in with it to use it remotely. I don't use facebook, nor do I want an account. I also see the Joule which is quite similar, but you can only control it from a smartphone. I'm a tecky guy, and love the idea of being able to monitor and control things remotely, but I don't like something of this nature that requires a smartphone to run. Steve, you need an account to log into the Anova but I don't believe you need a facebook account to log in. I don't use mine remotely because it keeps losing the wi-fi connection (and I'm not away from home all day), but I did set it up to try. :) I can't confirm it because my phone just died. You do have the option to log in online with your facebook account - but it's just an option. I was reading that it was a recent update, but would be nice if it was in fact just an option. Wow. Mine are the first edition and manual. It was the remote connection I was thinking of. So, the thing with Facebook is that you don't have to make an account in your name. Make one for Anova J. 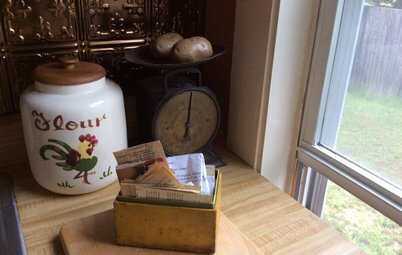 Cooker, Jr. Don't fill out any of the demographic details or personal questionnaire, but you have to put in a birthdate, so put your correct year of birth to tell them you're an adult and the month and day the device arrives, or some date you can remember. So long as you're not trying to defraud anybody, you can use whatever name you want. There's even an option to identify your cooker as a fictional character if you want to. You do need to tie it to an e-mail account, so get a free account on Yahoo, Gmail, GMX or similar, and sign up for e-mails from Sur La Table and Williams-Sonoma (or wherever) so there will be account activity even when you're ignoring it. That's like 15 minutes of effort. Then you can just sign into FB to do your wi-fi cookery, and otherwise ignore it. Steve, why not cook in batches freeze, then just sear when you want to eat? I always have steaks and chicken in the freezer, I put it in the fridge in the morning, and its ready for me when I get home to finish. Really fast meals. Plllog, we’re a long way from even digging our (new) garden, but if I couldn’t use a mini tiller, I’d just hand dig a trench with a small (grub) hoe prior to ground hardening (cold here in the winter! ), add my compost/leftovers from a small pail I’ll keep under the prep sink, and fill in as I go. In the spring it could be tilled in, with mini tiller or hoe. We have city trash pick up too, but they sure don’t offer compost – lucky you! Steve, my Anova is the one with the ice bath feature, which I won’t bother with. You can sign in without Facebook (just start an Anova account). I was going to test the ice bath feature for you, but you are limited from 8-18 characters for your router password, and mine is far longer than that and I won’t change it for a test. However, when I google this, I see that people are losing their connections with wifi as well as Bluetooth (mine won’t stay connected via BT if I just walk 10 ft. away). This is an issue I wouldn’t bother with. Also the ice bath method is not precise regarding timing. I’d just leave it on all day as plllog suggests, or as Islay suggested, batch cook and freeze, thaw as needed or thaw and re-heat in sous vide as I mention above. Cell phone apps are great when they work, but I find they most often do not when wifi or Bluetooth are required and the phone needs to stay in close proximity to the device attached. Bluetooth for sure needs to be in proximity to work. That's built into the way it functions. Wi-fi should work from anyway, assuming you have a good router an all, but you have to use a device your router recognizes. If you aren't using your mobile on the same router, you have to be able to dial into the router over the internet. It can be done, but it's probably not foolproof. That's why I didn't get the appeal of the bluetooth app. Why have to get your phone involved if you can just walk up to the device and turn the wheel? Bluetooth remote control apps are great for things like the color changing light bulb I have on a a microetched piece of art. I don't want to be getting up on a ladder just to reprogram a lightbulb! With the app, the bulb is cheap, and I get remote control. But there's no reason to do more than fifteen feet away, so the limitations aren't noticeable. plllog, I understood you didn't have room to dig - I worded my post wrong and meant that was what I planned to do (rather then try to find room for a composting area outside). Still envious you get free ready-made compost! I'd love to have that for my flowers! The only time bluetooth works for me is our little Bose speaker, and it's off when not in use, so we don't lose signal. Wifi is good here, I can drive down the street before losing it - it's the Anova's 18 minimum character router password - mine's 60 characters+ (I use it for my business so I'm extra cautious!). Honestly, though, many apps are just too buggy these days; work better with newer phones, don't work with tablets, better with Apple vs Android, don't work with older phones, or whatever. 60 characters? holy crap, that's insane 2many. (it's 2many!) If that's written down somewhere so you can remember it, then it's less secure than a much shorter password you can remember. Thanks for the note on the not requiring facebook btw. I actually installed the Anova app last night and created an account to test it out and it in fact did not require a facebook account. Not sure why reviewers thought that. Steve, pretty sure that they did require it a year or so ago. I don't care for the app very much, and I certainly wouldn't trust it to work when needed when I'm out and about. I have an ipad that I keep on my counter, and I use it when I want to use the app. I did a skinless turkey breast tonight. Very similar to 2Many's chicken breast..... I used fresh rosemary and sage, dried herbs de provence, butter, salt and pepper in the bag. 2 hours at 149 and it was moist and tender and similar in texture to a roast turkey. I also did a mushroom sauce, and a salad. All in all a good meal. Ha! Steve, good point about the long passwords, but I'm rather a fiend when it comes to keeping things very safe and very secure (a requirement in my business). My backups have backups, and those backups have backups. LOL! I gotta agree though with sherri1058 regarding trusting an app from long distance. Sherry, thanks for mentioning your turkey breast time and temps! 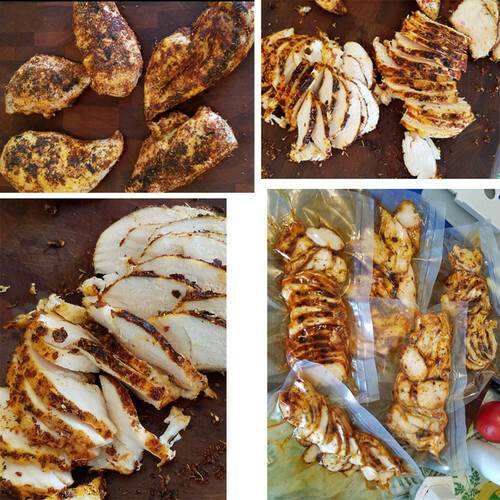 I did chicken breasts a little lower and not as long the first time, then used those exact same time and temps you mentioned and far preferred the texture and tenderness. : ) Amazing what 1 degree and 30 minutes difference makes. I'll make a note on my spreadsheet about turkey breasts. 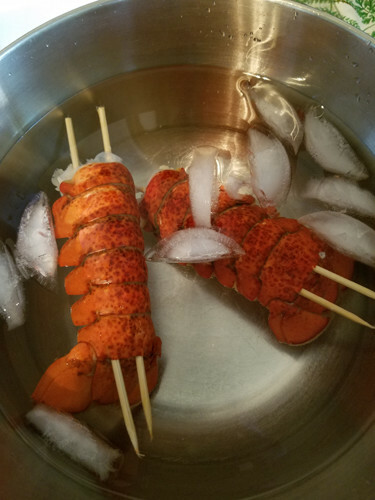 I've decided to try lobster tails again hopefully tomorrow (hey, it's a little cheaper than fast food), and will par-boil them briefly to see if I can keep from mangling the meat when I remove it prior to sous vide, then tuck it back into the shell. I'd like to again sous vide in the shell for presentation when we have guests. DH doesn't mind being the guinea pig, nor do I! Will report back (with photos). Also, the Select new york strip steaks will be redone again for a longer time, just to see how that goes. I can find Prime, or Select, but no Choice cuts. Crazy, huh? I think Choice is just out of fashion. People like the price of Select and the marbling of Prime. And the snob value of buying "the best". I prefer what used to be called "top choice". According to the meat industry there is no such thing, but that just means it's not an official grade, and probably can't be advertised as such. The butchers used to have it as a subgrade. I don't know for sure if the parameters were even the same from one to the next, but here it meant well distributed marbling, like Prime, but significantly less total fat. Not in fashion, though. Pity. 2Many, yep, time and temperature makes a difference. I did pork center chops tonight. I only had time for 2 hours, and I did them at 149 (don't ask why, I don't know, a momentary lapse). Long story short, DH thought it was great, I disagreed. They were too chewy. So what this tells me (aside from the SV aspect), is that I'm lucky to be married to someone that likes anything I feed him! sherri1058, and isn’t it wonderful to have husbands who think we are the greatest cooks?! DH is the same! Found a huge whole turkey breast with skin and bones at the store yesterday, then chickened out (pardon the poultry pun!). I wasn’t sure how long to sous vide it, so got more chicken to sous vide for our lunch sandwiches instead. You’d said yours was skinless, and I didn’t know if it was the whole 2 breasts with just no skin. Need to look up the time for it. 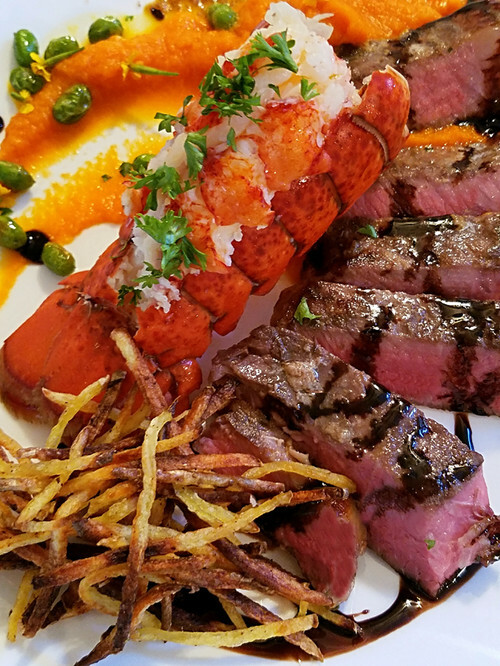 I have the lobsters sous vide, ice-bathed, and in the fridge – may have to hold off on our surf and turf as we’ve had a few things going on today. Par-boiling for 1 minute prior to sous vide did not keep me from mangling the lobster tails! I’ve got the chicken breasts in the sous vide already and will blacken it, I think. We could always eat some of that for dinner. 2Many, it was a half, actually, and it was from a smaller turkey. I have to keep reminding myself that it's not the weight, but the thickness that dictates time. Today I have a blade steak in the water. I'm going for about 10 hours (unless someone tells me otherwise). I think it will be really good with Sherry's fire and ice salad. Thank you Sherri. I thought perhaps you might have been talking about one breast, which is why I put it back, thinking I'd have the sous vide otherwise occupied for something larger. I looked it up but am finding from 131 t 185 F, and 10 - 24 hours... huh. I'll figure it out! Nope, haven't done a blade steak yet. From what I can read online, it seems 10 hours to 12 is the best? I now err on the side of less time and then do again if needed! Let us know how it came out, OK? Isn't this a wonderful adventure, Sherri?! Rubbed/rolled chicken in rub, seared on high heat with 2 tsp. avocado oil, about 30-45 seconds each side. I took my steak out at just over the 10 hour mark and iced it down and put it in the fridge for later this weekend. Fingers crossed that it turns out good. I think I will try darch's "sneak a bite" suggestion and either just sear it or put it back into the water. I think that the chicken breast @149 is just about our favourite. DH loves SV, almost as much as he loves leftovers in the CSO (and that's saying something!). I figured if chicken breast @149 was what we really like, then turkey breast at the same temperature would be great as well. Reasoning may be flawed, but in practicality it turned out. Beginner's luck?? Did I tell you I tried the shrimp? Using the Serious Eats guide I chose 140 for 15 minutes. I didn't like it.... next time I'll choose a lower temperature because it just seemed overcooked. Maybe it was the shrimp (could've been, but I buy my fish from the same place the top restaurants and retail stores in the city buy from), or maybe the description in the Serious Eats article just wasn't what I expected. No, you didn't mention the shrimp but so glad you did. I looked at the photos on Serious Eats, and the descriptions and I'd have picked 140 F too. Not real sure I want to go down to 135 (I'm not a "barely opaque" shrimp eater!). Let me know next time you give it a go! And if I do, I’ll let you know.. I added hot peppers to the skirt steak marinade to see if I could stand “the heat”, so depending on the marinade, next time I’ll sous vide several skirt steaks and freeze. Sherri, do you thaw your pre-sous vide steaks/chicken/etc. first or pop it in the sous vide to warm up? Do you use the sous vide to warm anything? What times do you use? Sorry to inundate you! LOL! So, I did do the surf and turf last night, and it was amazing (except I spent too much time on presentation/plating and it was not hot enough for us, duh!). The steak we shared, a Select (with no marbling) New York Strip steak, on sale. Last time I did it at 132 F for 4 hours (didn’t have more time) and though it was fine, I knew it could be better. I’ve read 2 hours for Prime, 4 for Choice, and 6 for Select. That was spot on! 130 F for 6 hours, seared quickly (about 45 seconds both sides, and I pressed down on it also). Incredibly tender, juicy, flavorful, and still had that lovely meat texture. DH and I loved it. Oh, and I did season, including salt, it in the sous vide, and that did not take away any juiciness (as I’d read could possibly happen) but added to the flavor. I wanted to practice lobster in a nice ‘presentation’ for serving to guests, so again, tried sous vide in the shell. First I clipped the sharp edges while I had a pot of water attempting to boil. 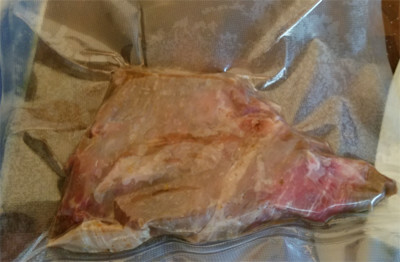 That’s to the sous vide bag won’t get holes, but also it’s nice when trying to remove the meat (no finger pokes!). 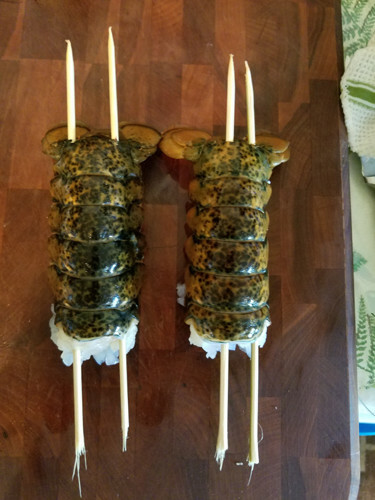 Then I skewered it so the tail wouldn’t curve (Serious Eats or Chef Steps I think) and popped it in boiling water for 1 minute (said 1 to 1 ½ minutes) then into an ice bath. Then cut down the center of the shell and tried to remove the meat without mangling it (by par-boiling). Uh, I failed! LOL! Anyhow, tucked it back inside the shell after a wee bit of salt and 3 tbs butter on each… 140 F for 45 minutes. Again. Sous vide finish – showing the underside – the vacuum bad seal doesn’t break if you trim the shell well. You can use ziplock. Iced the lobster, into the fridge, then put it in with the steak at about 1 hour 14 minutes to go. The lobster was still perfect, but it shrunk! So, next time not as long to re-warm! DH, the seafood hater, loved the lobster. But it was that cheap steak that stole our hearts. BTW, I roasted garlic and rubbed the steak with that as well as seasonings in the sous vide. Hey, anyone else want to comment on your preferred shrimp time and temp??? Might give us two budding sous vide'ers something to go on! We had the blade steak tonight and of course DH loved it. I was going to do a taste test and determine whether it should be put back into the water or just seared. Well, I forgot, and ended up just searing it. I think it could have benefited from a couple more hours in the bath and next time I won't be afraid to do the longer cook (I took it out at the 10 hour mark), but it was still good. Just not quite as tender as I would have preferred. I did carrots sous vide, and probably won't do them again..... they were good, but quite frankly, I think the steam oven does as good or better... and easier. One of the things that I need to figure out is how to sear after the bath. I bought a cast iron griddle (not grill) and threw that on the bbq today (I was afraid if I used my regular cast iron pan I might mess up the seasoning). I definitely like it better than just using the grate. No grill marks, which is fine, but also better colouring (crust) with the super hot pan. It seems that using it will give me the crust that I'm looking for faster.... so less chance of overcooking. YES! 2Many, This was the first time that I didn't cook immediately after pulling from the bath so I am asking the same question..... do you bring it up to temperature in the sous vide first? I didn't this time, and the steak was a bit cooler in the center than I would have liked, but because it was thin (1/2 inch or so) it didn't overcook. I really dislike these learning curves!! Re the shrimp. 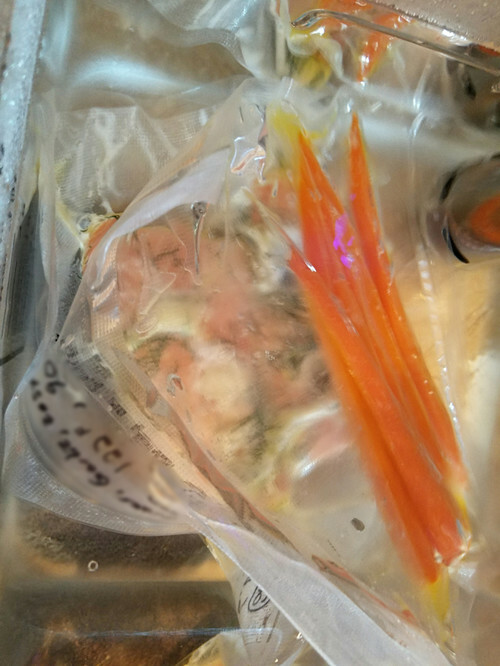 Honestly, I felt that 140 was more of a "boil in bag" than sous vide. 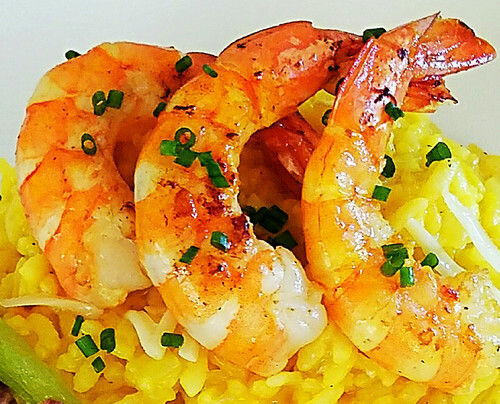 I totally agree that 135 seems too low and not my idea of how to serve shrimp, but maybe somewhere in-between? I'll try again, but it's not something that I cook often. Sherri, thanks for your input on the blade steak (making a note!). Regarding the carrots, I’ll be getting a Cuisinart Steam Oven after the reno… how do you prepare your carrots in your steam oven? Is the CI griddle you used flat or does it have the ridges? I’m going to assume flat as you said no grill marks. From what I’ve read, searing on a griddle or hot-hot skillet produces better results. I’m wondering if one had a steak which was somewhat thick (or maybe even not), sous vide it under the temp desired, then finished it on the grill it’d be done correctly? Kinda doubting it, but not sure and I intend to give it a try! At 30 seconds sear, that’s not enough for grill marks or crust, and any longer we’re finding gets our meat too done. Huh. I’m thinking I need a griddle someday, ha ha! Regarding bringing it up to temp, the only thing I’ve read is pulling it out of the fridge and putting it in sous vide for about 45 minutes to an hour at just under (not at the same temp) your previous sous vide temp – so it won’t cook further. Then finish it. I think were it pulled straight out of the fridge and/or allowed to warm in room temp briefly it’d not be warm enough in the center, as you mentioned happened. I did that with carrots (put them back in the sous vide at a lower temp for an hour), and they were fine. Same with lobster – sous vide it higher than the steak, ice bath, fridge, then put it back in with the steak (at a lower sous vide temp). The lobster was perfect, although I’d have preferred it warmer, and it seemed to have shrunk – but then stupidly I put it in for over an hour, which wasn’t needed to warm it back up. 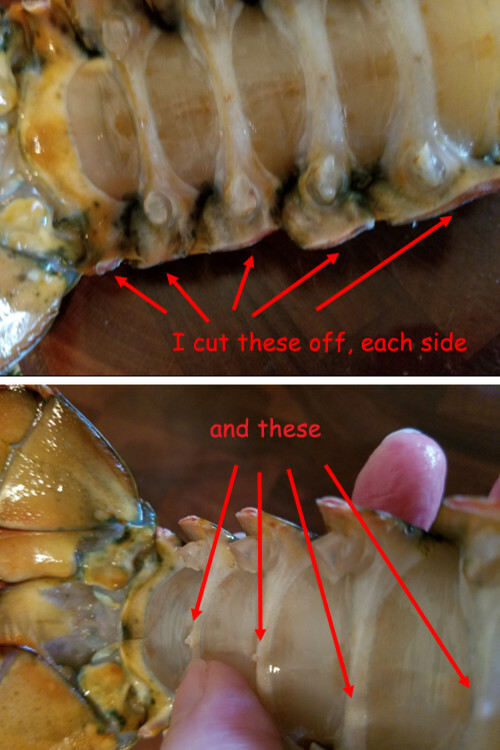 We’ve not had as many shrimp as we did last year, so I may try 137.5 at 15 minutes : ) I’ve seen a few recipes I’d like to try with the marinade in the shrimp, served straight from sous vide. 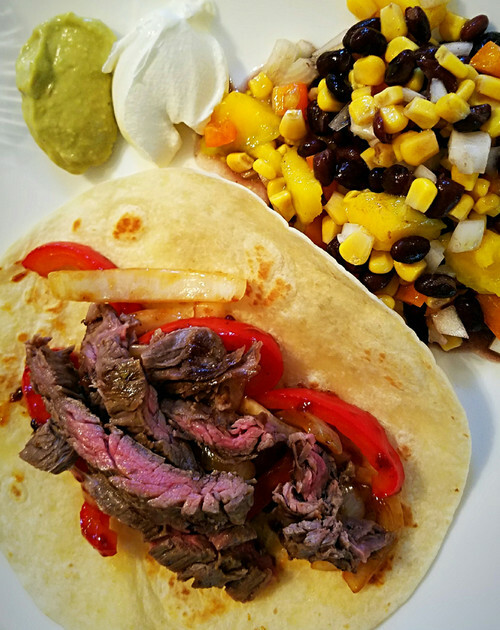 Last night I sous vide the marinated skirt steak for our fajitas the same time (12 hours) and lowered the temp to 130, which we also liked (and really only 1 degree lower than previous). I'd like to find thicker skirt steaks, sous vide 'en masse! ', and then pull them out and rewarm in sous vide for a couple hours from frozen at 129 F. Sure would be an easy meal! 2Many, you're waiting til after the reno to get your Cuisinart oven? Why wait, don't you need it NOW? lol!! Re carrots, I just toss them in some oil, salt and pepper and whatever herb or spice I feel like at the moment! I set the oven to 400, add the steam and 30 minutes later they are done. Of course, if you just want steamed carrots, you can do that instead. Here's a recipe for roasted carrots and parsnips for the Cuisinart oven. I picked up a Lodge 10 1/2 inch round griddle. as that is what I spotted at HomeSense. I like that it has a long handle and because it doesn't have sides, it weighs much less than my skillet. I don't know if it's my imagination or not, but fell that I got a better sear in a shorter amount of time than I would have just using the bbq. Or maybe it was because the steak had been refrigerated first. More of that darned learning curve! OMG! 2Many! I know you have remodeler's fog, but for heaven's sake! Go to a garage sale or thrift shop and get a solid, non-folding table that you can cast off again at the end of the remodel and get your non-awful Cuisinart oven. 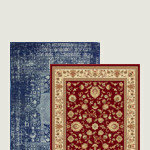 When it's unplugged and cool, cover it with an old towel or something to keep construction dust and debris off of it. plllog, You know, I thought of that ever since going ahead with the Anova purchase... but there are a couple hitches... First, the time it'd take to go to garage sales (we are so behind, and so tired of the mess we live in, every spare moment we have energy to work on our too-many - 2many! - projects counts). Then there is 'where to put the table'! If you saw our living/kitchen space currently used, you'd see we don't have room for even a small table without running into it. It's already far too overcrowded, and I'm forever moving heavy bins to walk around where we are working - then moving them back. I can live with the old toaster oven... besides, at this point, all appliances must be run one at a time or it's a tripped breaker! I can't wait to get the new wiring inspected (that'll be awhile) so we can connect it. Last night I put the frozen center cut pork loin chops in the sous vide too early... They were in for a full 4 and 1/2 hours... 1 hour longer than intended from frozen. Still, they were perfect, and actually more tender than the first efforts at 3 hours, thawed, and no mush! The texture was still wonderful, and this meal left us wanting more! I'm so in love with sous vide ! So the lesson learned last evening is pork chops can stay in sous vide at least 1 hour longer than the 3 hours and actually gain some tenderness without losing moistness and texture. 2Many, thanks for the tip about the chops. I have yet to try them again SV. Our grocery store has strip loins on sale today for less than 1/2 price, so of course I had to go and check them out. Fortunately I had read your earlier note about Choice, Select and Prime because the steak had the USDA grading label (What's that doing in Canada?? LOL!) Stores are sneaky, they were so much cheaper because they were Select! Anyway, you said they are amazing done for 6 hours, so I that's what I will try. I'm not sure whether it will be tonight's meal, so I'm wondering if it is better to SV then freeze or SV then refrigerate or freeze then SV? So far, I've just been doing everything from fresh. Actually, I just read that Islay always does the SV and freeze, so I think I'll give that a go. Thanks Islay! Let me know how that comes out please Sherri... I've not yet re-heated an already sous vide dish! Ha ha ha! USDA label... yep, sneaky! Sherri, I've decided to attempt shrimp tonight - I'll let you know Monday how they came out. Will try 137.5 F (ha ha, finding that middle ground!) for 15 minutes. I'll take a bite to test them, then want to sear them very quickly (the recipe would be better if they were seared in my opinion). I cooked some veal chops today (3 hours @ 131) and they are now in the freezer. I'll let you know how they turned out later! I ended up getting busy the other day, so the strip steaks went into the freezer pre-SV. There are something like 11 different species that are classed as "shrimp" and all different sizes. Some are cooked and over if they sit looking at the pan. Others take as long as six minutes to cook and can take a sear. Re "mush", I'd think poultry would go there before pork, given the textures, though I don't have any experience with the latter. The great thing about sous vide, the whole point really, is that it's still perfect if dinner is delayed an hour. Something very quick cooking, like said shrimp, might be different, but while some things won't do like steak, where you can put it in expecting it to sit at full temperature for hours and hours, you shouldn't have to worry about it for an extra hour. Though do be careful since "more tender" is the first step on the road that does eventually lead to mushy. I usually SV, then freeze. I'm usually Vidding a meal for that night and just use the bath while at it to Vide a couple more meals for the freezer. I've never re-heated in the Vide. 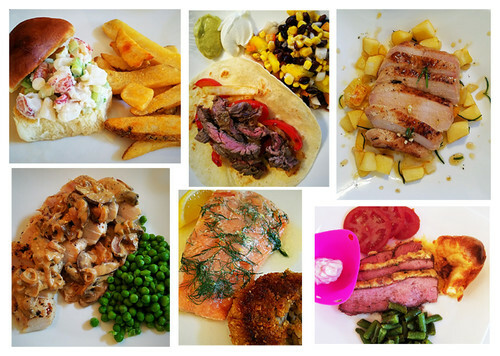 Before SousVide I always took out a frozen meal day before so I just do as I always did. Thaw then sear. Frozen, not previously SV, is a great option if unprepared for a meal....straight from the freezer. Another grill quick sear method if you use natural charcoal and have a chimney starter like THIS, you can fill 1/3rd or halfway, set inside your grill but don't dump out the coals. Just put a small grate on top of the chimney and sear directly on the chimney starter. Works great for two thick steaks or pork chops. 2MD, you asked about cooking from frozen. Because of time constraints, I haven’t carefully read all of the answers above, so this may have already been covered. Cooking times: Generally speaking, there is an easy rule for determining the cooking time for a frozen food. (There are exceptions, and we get into those below.) Take the recommended time for cooking fresh food and divide it by two, then add that number to the original fresh cooking time. So if you typically cook a one-inch steak for an hour and you want to cook a frozen one, you can calculate the cooking time with this equation: 60 + (60 / 2) = 90. Voilà! Your steak will cook in an hour and a half. Sherri, Do let me know how your veal chops came out please! Plllog, my experience thus far is you’re absolutely correct in that chicken will go to mush sooner than pork. I’ve got our chicken at just the perfect texture, which is very tender, but much more time added and it’d go to mush I’m sure. The pork chops are more forgiving thus far. Sleevendog, thank you for explaining. I’m trying to get my sous vide’s to the perfect doneness before I do batch cooking to reheat (finish) quickly. I’m ‘there’ now for many things! I’m loving having salmon prepped for SV and frozen, ready to make a fast meal! Also want to say a huge thank you to sleevendog and bbstx for posting the FDA table, and the link to Baldwin’s site which also has pasteurization tables. I’ve already been thinking ‘what if’s’ in my head for experiments later when have time, and those will help and reassure me on safety! I’m sure others will find them very helpful – I’d not seen them. Bbstx, thank you for the links – very detailed and informative, and I appreciate the ‘from frozen’ information – thank you so much! I decided to try pots de crème in the sous vide. I’d previously tried cheesecake in the Instant Pot, and it was not the more custard-like texture I prefer, but still good. Being a self-described Custard Snob (ha ha!) and believing there is no such thing as the perfect chocolate pots de crème due to the nature of chocolate I decided to give it a go! 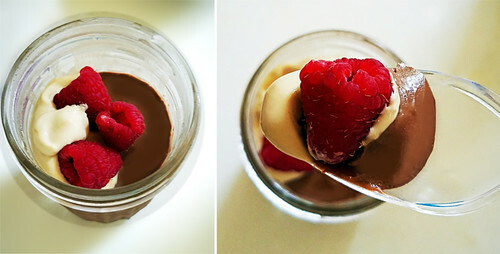 Chocolate pots de crème, in 8 oz jam jars (would go for smaller and wider next time) – I was astounded. The chocolate had the custard/creamy texture that eluded me in bain marie’s. When I pulled them out of the SV, they still jiggled : ) Out of the fridge and the texture was that of vanilla bean, etc., pots de crème. SV pleasantly surprises me again! So glad I came across this thread! I borrowed a sous-vide cooker, older model with manual controls only, no wi-fi, no bluetooth. So far, I made a gnarly chuck roast that tasted like prime rib when cooked (! ), a huge pre-marinated chicken breast for a pasta salad, and today, boneless, skinless chicken thighs that were frozen. With the thighs, I sliced in 1/2 lemon, and sprinkled with a garlicky spice mix I bought at Costco. I made a sauce from the juices, a little chicken stock, garlic and mushrooms, and a bit of Dijon mustard. Yum! I want to buy my own sous vide cooker but am looking for one that has the option of a manual control. Any suggestions? I’d think they all do but really don’t know. My Anova has Bluetooth but it cuts out and is generally annoying so I don’t use it. I imagine WiFi is better, but I’m not imagining what I’d use it for. I highly recommend immersion circulators, like the Anova (which I also have). You can use any vessel for your bath. I've used deep roaster pans, saucepans, and ice chests. Same circulators. I have the Anova circulatory and a Klarstein water bath. The Anova is more accurate and powerful. I don't have bluetooth or wifi with it and frankly, don't need either. Last week did duck breasts. Brown the fat to release some of the fat...just to golden colour, not to cook the meat. Bag with seasoning of your choice. Cook at 58°C for 1h30, then sear again. Don't know what that is in °F. Perfectly tender and juicy. Like FOAS and plllog, I have the larger Anova. It has bluetooth, but like FOAS and plllog, I find setting it manually to be more reliable. Sign up for emails from Anova. They sometimes put their circulators on sale. For example, the Nano model is regularly $99. On New Year’s Day, it was on sale for $64. In the many years I have been using sous vide, I never once had wished that I could turn on/off my cooker remotely using my cell phone, or see the cooking temperature from office while I was working, or tell Alexa to change cooking temperature --------. I can see the Bluetooth option being useful for a family that can't sit still where the cook doesn't have the time or patience sit around and wait for the cooker to come up to temp. The ability to get a simple notification on your phone or other devices can be very useful. Beyond that, I find it to be quite useless. The Wi-Fi option however, for those working families that want a longer cook while they're at work all day can benefit from being able to check in from time to time to make sure all is well. Imagine starting a low and slow cook that's going to run for 8 hours or so for a large piece of meat, and an hour after you leave, the power goes out for a few minutes. You'd come home to cold water and likely ruined meat. Or if you're running late and want to start heating the water on your way home. It's a quick couple taps. 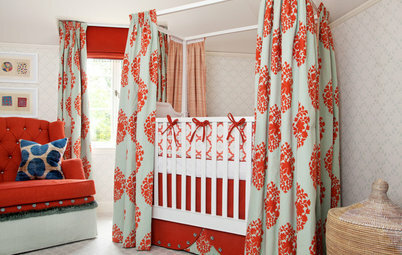 it certainly doesn't take long to come up to temp, but if you're crunched for time, it can save you some time for sure. Not everyone will benefit from these options, but some do. I bought the larger Anova myself with the WiFi/Bluetooth option and find the WiFi option to be quite stable in my WiFi configuration. It's never not worked. I don't think I'd ever use it as the sole means of control, but it allowing me to monitor my cook gives me piece of mind. Or if you're running late and want to start heating the water on your way home. It's a quick couple taps. But that's beside the point. Steve J makes good points for how using remote contact can be useful. Whereas most of the bluetooth stuff, I think, is for using the app to control the device, because people who don't cook want magic push buttons to do the work. I need to look up times/temperatures too, but I do that by checking references I trust and comparing with the end product I want, etc. But I do that with all kinds of recipes, so why would I let a recipe in an app cook for me? Oh! Another piece of advice: Use bags that are meant for cooking, not just storage, and you might need a better than entry level vacuum sealer to make a good seal on those. 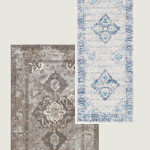 Or skip the sealer and use water displacement. The vacuum does help drive the marinade/flavorings into the meat. I don't know why I haven't seen this thread before. Apparently I've been in an awake coma. How could I have missed it? Now excuse me as I go back and read carefully from the beginning and goggle, ogle, and boggle at the photos of delicious food. If I don't post for awhile, its because I couldn't control myself and started chewing my phone screen. My whole network is enterprise grade and on a battery backup that will last for hours. I’m an IT nerd so that part is covered for me. I have a question concerning sous vide cooking. For NYE, I cooked a 13oz. piece of tenderloin. The recipe from Chef Steps called for pre-searing in oil, then lightly sautéing thyme and rosemary in butter, placing everything in a bag for cooking, etc. I used a Food Saver to vacuum seal the meat and seasonings. A bit of the butter/oil/meat juice was drawn out of the bag causing me to stop the vacuuming before it was completed. Is there a way to vacuum seal a bag containing liquid? I hung the bag off the countertop thinking that would help. Perhaps it helped, but it didn’t prevent liquid being vacuumed out of the bag. freeze the bag with the liquid first. Doesn't your Food Saver have a "liquid" setting? It should. 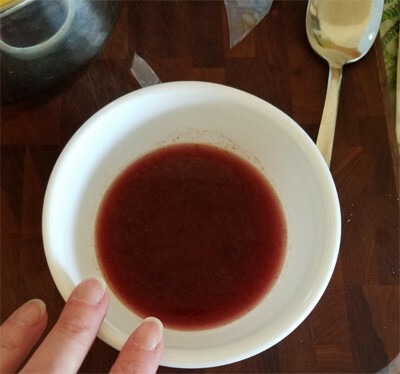 I sometimes get it wrong, thinking something is dryer than it is, but basically dry for rolled oats, wet for raw meat, especially if there's a sauce or marinade, however small, but also just the juice from the meat. Everything I’ve read says not to add butter or liquid to your sous vide as it will pull flavor out of your meat. You can add what you like. There are so many internet opinions about sous vide that really the only way is to experiment and keep careful notes about what works for you, the cuts you like, the results you enjoy etc....... do your own thing. I keep a spreadsheet . 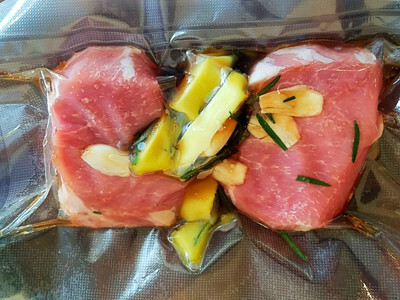 For a bag with liquid, use the displacement method rather that your sous vide machine. Yes, freeze the bag with any liquid or marinade if planning ahead, (not the meat, just the liquid) or use the displacement method like mentioned. I rarely use anything but a dry rub with meat but do like some butter, lemon slice etc with seafood. I have the most basic foodSaver. I just hit the seal button early if some liquid starts to travel up the pike. Steaks and burgers I give some air-dry time...un-covered in the fridge. Compound butters are in the freezer in portions so that is grab-n-go. Can't remember if I've ever pre-seared. Oh, that I was organized enough to plan ahead enough to freeze the liquid! Plus, the recipe that I used called for adding the fat and the pan juices from the pre-sear to the bag. It also called for a post-sear, which didn’t happen. While the tenderloin was in the sous vide, DH cleaned the stove. I didn’t have the heart to mess it up again with a post-sear. I need to drag out my Food Saver and see if it has a wet setting. If I were to pasteurize eggs in my sous vide set up, would I just put the eggs in the pan, or should I put them in a bag first? No bag necessary for your eggs. My foodSaver has the moisture button. It does not work for liquids. It is just meant for 'wet' food like a fresh wet steak, etc. Moist food. Finally got mine out. Nope, no moisture button. Watched a YouTube video on sealing “wet“ food with my model. They suggest putting a folded paper towel between the food and the seal or better yet (drum roll, please) buying the FoodSaver bags with a built in moisture dam! I think I’ll try to plan ahead, instead. Bbstx have you tried the deplacement method? Just put the food and liquid in a ziploc bag and gently lower it into water. The water will push the air out, then zip it up and cook. Simples! You can buy inexpensive food grade weights to put inside your bag to weigh down the bag. This can make the displacement method a lot easier. IC, although I’m aware of the displacement method, I haven’t tried it yet . Seemed silly for me to do that when I have a FoodSaver, but I can see that there is a time and place for each method. DC, I’ve read about putting a spoon in the bottom of the bag to weigh it down. Would the weights be better? I try not to have “one trick ponies” in my kitchen. bbstx, the weights are specifically designed for SV use. A spoon can create some air pockets. I reuse SV bags. 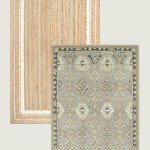 The displacement method allows you to save lots of money. Fillmoe, I second the Anova – love it! It has Bluetooth but I don’t bother with it, ever. Just use the manual controls. I think I got the Bluetooth model as it had a slightly higher wattage. Not necessary as it turns out. The Bluetooth was activated briefly and I found unreliable so I got rid of it. Didn’t want it anyway. As for wifi, my password is too long – it won’t except it. However again, not needed, but I can see for some cooks, it might be quite useful at times. Glad to hear you are having such success and enjoying playing! Regarding pre-searing, I doubt I’d ever bother unless I’m just missing something. Perhaps to sear off extra fat that I want to use somehow in the sous vide. Bbstx, I’ve (as seen above) pre-frozen some liquids to seal in the food saver, but I’d most likely use the immersion method instead. I will admit I find the immersion method fiddly, and sometimes downright frustrating. As dcarch says, pick up some sous vide weights – very helpful! Yes, weights are better IMO. You can separately bag a spoon and place it in the bag of food, but it’s still a pain to me, having to do the immersion method with 2 bags… and I don’t like the idea of putting utensils directly in with foods for a couple reasons. So yes, some food savers have a liquid setting but as Sleevendog explained, it’s for moist things like meats. Not liquids. Those must be frozen or left out. Mine has that setting, and I don’t find it different than the regular setting really. I do like liquids in some of my sous vides, and I do often pre-season as well. Again, it’s a personal preference. I would not salt salmon fillets, but I do salt and use other seasonings with meats, just less than usual because after sous vide I will remove some of the seasonings as I dry the meat for searing. And pre-marinated meats are a favorite for us - again, in the above comments skirt steak marinated between 12 and 24 hours prior to sous vide. We’ve been entirely without a kitchen now doing a renovation and I had to pack up the Anova too. Of all my kitchen ‘gadgets and tools’ the sous vide is the one I miss the most and will use the most often when I have a kitchen. I would not be without one now. Thanks, all. I'd almost talked myself out of buying a circulator, but I looked at the pictures at the beginning of this thread and I'm on again! For those of you who are only now being "thanked" by me, my sincere apologies. I just noticed many were not thanked so long ago, but I remembered to click the like's. Bad 'thread hosting' on my part there. That's so funny, as I was just wandering through Cooking from last year, searching for a recipe. The search function leaves much to be desired, so it took a long time, but I revisited some good times. Cheers to you! Interesting about the ping pong balls. Re weights, wouldn't ceramic pie weights work? I never thought of it until now, but I have way too many of those. I have a small Igloo Cube that I use to for sous vide. Rather than cut a hole in the top, I have covered the top with plastic wrap. It is pretty disappointing. I think I’ll invest in some ping pong balls! Mercurygirl, hi!! Yep, my searches of late have had odd results, but sometimes they take me to some interesting things! RE: ping pong balls. I can see how they’d offer good insulation, being filled with air. The container I use has a lid that the Anova fits into, and since we’ve got extra ice chests we’ll never use, I think I’ll just cut a whole in the lid for anything large should I need that. The plastic container with the lid worked well for my one and only (thus far) long sous vide of 27 hours. I just put a towel on top of the thin lid, and though I checked on it, no issues. Those ping pong balls should work well for an ice chest one doesn’t want to cut holes into. I am not sure why they feel PP ball is an excellent idea when there are other options. 1/2" thick foam board, cut into identical rectangles to fit your tub, will take a lot less room to store, 10 times the insulation value, easier to clean, and no evaporation. dcarch, one of the reasons that they give for PP balls over a lid is that the hole in the lid funnels steam out and toward the “delicate electronics” of the circulator. I was just thinking about this. Are the electronics actually that “delicate” or is this an attempt to be overly persnicket? It is true that digital electronics are extremely sensitive to weak electric voltage and currents leaks, and there are literally millions and millions of semi-conductor packed on a chip smaller than the "o" alphabet on your screen. Definitely moisture can fry your expensive SV tool. There are so many holes between each PP ball to allow moisture vapor to rise, compared to custom foam board, it just makes no sense. The ping pong balls is the same principle as those nylon disks for keeping the heat in swimming pools. It doesn't have to be perfect coverage. I think the reason for suggesting them is a lot of people have old ping pong balls that are past bounce that they don't want to throw away. I agree that insulating board would be better, and most of the big chain hardware stores with building supplies will cut it to size for you for "free" (that's what makes the price worth going there rather than the lumber yard). You could easily put a flange around the circulator at hole in the board height and maybe make a small steam escape hole at the other end if you're really worried about steam. Plllog, could you direct me to the 3 day chuck instructions, please? 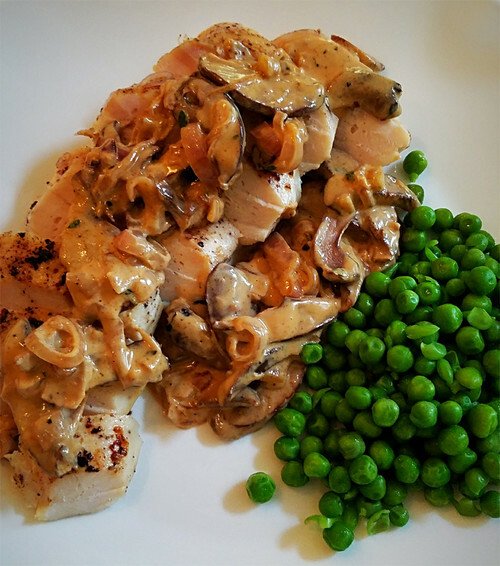 To be honest, I dislike chicken breast... always too dry and tasteless, But I did work on and create a sous vide recipe for it that keeps it moist enough to enjoy and eat. Since I am now raising my own chickens, wasting food is not something I want to do. Came up with this, and if you sous vide, give it a try. Artemis-ma, thank you! I've saved your recipe : ) As it has bacon and onion DH will love this, as it has spinach and mushrooms I will love it, and as it has all, we both will love it. Question - DH won't touch goat cheese, and frankly I'm finding our grocery store goat cheese far too strong (unlike that which I used to get in New Mexico). Rather than coconut milk, would there be another cheese (I'm thinking perhaps not, nothing really resembles goat cheese in flavor and texture) or should I just leave that ingredient out? By the way, it never occurred to me to try bacon in sous vide, which makes not sense as it does add such lovely flavor. I agree, many recipes with chicken breasts are often dry. I've got an Instant Pot Butter Chicken that is tender and moist, but that's a rarity. Sous Vide changes the game for me on many proteins. There are lots of bad recipes for everything, but there are plenty of ways of making chicken breasts which are good and not dry! Though, of course, sous vide is dead easy. ;) I think you could substitute any semi-soft cheese with a good moisture content for the goat, though I haven't made that recipe and don't know how important the tang is. You might also find me nattering about it in the threads from Spring a couple of years ago, but I didn't find any details. I ordered 18 lbs of bison and they gave me a whole shoulder. :) I had to whack it into chunks to get it into the bags, and I don't remember if I seasoned it first. What I remember, and what I did find that I shared here, was that after the 36 hours in the water, I let the meat rest about half an hour, sloshed on some low sugar, tomato-y barbecue sauce (the one I made for FOAS) and put it in a low oven for a couple of hours. The reason for the sauce is mostly to keep the edges from drying out too much and getting hard. I'm sure beef would be good, but bison is even better! Ping-pong balls makes perfect sense. We just need to slow down evaporation. They just roll aside when removing any packages. They dry quickly and store in the container. (and they look kinda cool). Styrofoam is cheap and free in many delivery packages. I use them as well but mostly for seed starting and macro-greens to raise different trays growing at a slower pace so I never need to touch my light banks. I just bought a hig, cheap, plastic box with a lid, cut a hole in the lid, and wrap a tea towel round the gap that absorbs any moisture. Cover with towels/blanket to insulate and voila! Cheap. No water loss. Bbstx, I've found the best recipes, times etc are here. Thanks, IC. I’ve used Chef Steps before and been pleased. I was just wondering if plllog had a T&T recipe for her chuck roast. I am curious about any roast-size chunk of meat. When reading Douglas Baldwin’s advice on Sous Vide, I was under the impression that meat should never be more than 2.75” thick. Chef Steps shows lots of roasts that appear more than 2.75” thick, such as this https://www.chefsteps.com/activities/reconstructed-roast (I don’t think I’d ever “reconstruct” a roast, but it was interesting to read about.) What is safe? Blind trust of Kenji? I'm guessing that the thickness thing is about how quickly done it gets vis-a-vis potential to go mushy. You'd have to overcook chuck to a faretheewell to get mushy! :) But that's also where the three days in the circulator comes in, I'm guessing. To get the middle up to temperature and have the connective tissue of the chuck dissolving. That's why we low and slow it always. You wouldn't want to do that to a chateau! I can just imagine what that would be like! (hint: gross). I almost never sous vide single portions. I've made a lot of rolled turkey breasts sous vide, that's 3-6" thick. The bison chuck pieces were a lot bigger than that, though they also were in the oven for hours, and it's no biggie if the middle of the beef is pink (but I don't think it was any different than the rest). :) Recently, I did a whole turkey breast with bones. No problem. If I'd have read Baldwin rather than just kind of charging forward and doing my own thing, I probably wouldn't have taken up sous vide at all. I'm not going to bother for something I could just throw in a pan and finish in half an hour! I've cooked thicker than that and am here to tell the tale. Frankly I just find chefsteps more serious than many other sites. Like Islay, I've also cooked thicker (roasts) with no issues. 4-5" thick if memory serves correctly. Thus far, my SV times have been dependent on the cut of meat, not the thickness. ETA: That's in the thawed state, of course. I agree, 2many. I do with temp for the degree of cooking and time for tenderness. I claim almost no experience except what I sometimes remember from here. 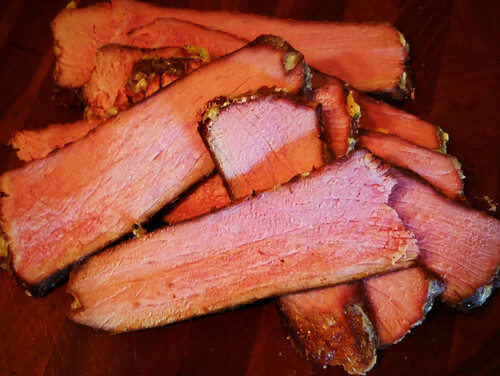 But I recently got a sous vide device and just had very good results from a partial chuck roast that seems right on point for this section of the thread because of its focus on chuck sous vide time of 24 hour or more timing and the above link to restructure of meat. 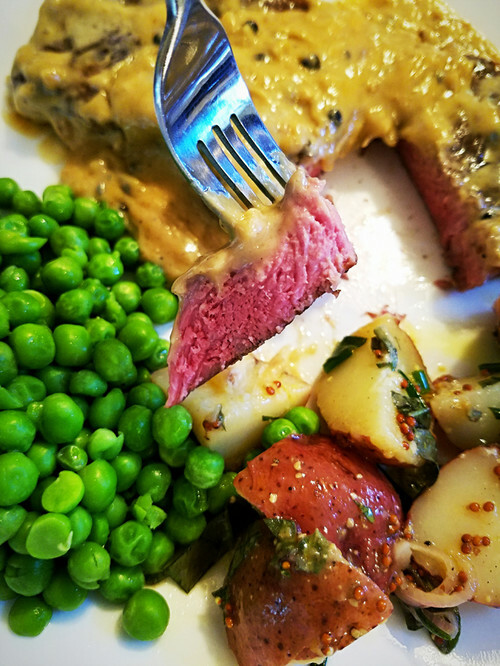 I can't seem to find any sources for an old memory (long before the cooking forum) that said a portion of the chuck was actually steak tender. 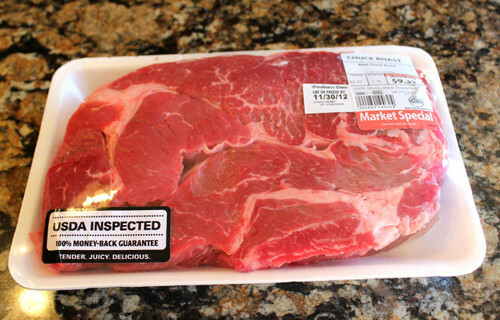 I believe it is this muscle group directly over and to the right of the 'usda inspected' label in the following pic. On occasion, I have separated this muscle (or perhaps the wrong one) and tried to make regular steak. It wasn't quite tender enough for that direct treatment but I had good results from kebabs without too much tenderizing. Anyway, I just tried sous vide for approx. 10.5 hours with this muscle group. We found it to be super tender and not mushy; the little sections of cut meat could be pulled apart if one had wanted finger food. I would guess that 4-5 hours would have been sufficient time for this piece of meat. Yes, I knew about dcarch's suggestion to open the bag, but I didn't. Perhaps I will try searing first and then a bag check will seem more appealing. When picking a chuck roast, I often try to find the one containing a larger section of that muscle group; it varies. Chas045, have I circled the portion of the chuck roast you are referring to? I did a trial run of the chuck do with what the butcher calls a "chuck steak" but I think it's just a slab off the chuck. I may be wrong. It's bigger than the part Bbstx circled, but smaller than the pictured piece of meat. It worked great in the bath, but got way too dried out on the edges in the oven (stand-in for smoker). I borrowed my father's meat saw for the actual day, but the sauce was sufficient to keep the crust tender. It's not very assertive, so the tomato and bit of sugar did their thing without really doing anything to the flavor. Just a little extra umami and moisture. @bbxtx: No; the portion directly below your circled part that begins under the label, extends rightward and then upwards and again to the right making a leaning 'S' shape. It is often much smaller. Several cheap steaks in bags of 2, mass SV’d to desired doneness. Drop in ice bath, label, then freeze. I only need to remove a couple from the freezer, pop in the SV at one degree under the temp initially cooked, it thaws and reheats in about 45 minutes, and meanwhile I whip up a quick sauce, some veggies, and finish by searing off which also helps to heat the steaks. Makes for an easy weeknight meal. Below is a Select New York Strip, little to no marbling (uber-cheap cut), with a (too thick) peppercorn sauce. It was quite good! fillmoe, and anyone else interested, have fun and enjoy! Yesterday, I made sous vide country style pork "ribs" on sous vide, 9.5 hours at 156 F. I used 2 lbs of the pork, so I have plenty as leftovers. I pre-seared because I had a marinate I didn't want to pat off afterwards (I think it more important for steaks, chops and fish to post-sear). I have yet to try sous vide from the frozen state. I did pork spare ribs on Sunday, I make a sauce with ketchup, soy, honey, garlic and a little Worcester. I brushed the ribs with a little sauce, bagged on the set setting and cooked at 74°C , 165F, for 8 hours, and finished in the oven with the rest of the sauce till sticky. Tender and delicious. All right, I posted my sous vide recipe for country-style pork ribs this morning. Very happy with them! This one used a pre-sear. There's a place for doing that. artemis_ma, thank you so much for posting your recipe : ) Though I prefer ribs on the grill throughout, there are many times I've thawed ribs and wish to prepare them but it's raining... this is perfect for those times! Question for Anova owners: What do you do with your immersion cooker after you have finished cooking? I usually dry mine off and let it set out overnight to dry thoroughly before I put it away. I did the same last night, but when I picked it up to store it, water came out. Not much, maybe a teaspoonful, but more than I want to have in the box I store it in. bbstx, I allow mine to cool if needed, remove the silver outside cylinder, remove the plastic cap on the end (just to wash), and give them a sudsy bath and rinse. That's if I've not done so time before last (otherwise I just give it a quick wipe). I let the rest air dry (being careful with the propeller part), and put it back together to store. Did you take off the plastic thingy? That might have held some water. 2Many, I didn’t know the plastic thing or the “skirt” would come off until I went to the Anova website earlier today! Up until now, I figured the gizmo was only touching water so I didn’t think it needed cleaning. I think over time some may experience calcium build-up, so taking the plastic thing off might be a good idea if you soak it in a vinegar solution. Our water here is hard, so I at least try to keep it dried off after removing it from the water.